Firelight uses a theme which is focused on both the fantasy inspired Phoenix bird and on things we know to have existed for real, civilizations of South America that are now long gone. Both these topics exist among the symbols of Firelight, with the main focus being on the remnants of a lost civilization and on the jewelry and idols that they left behind. The developer that created Firelight is called Aristocrat, and while they’re newcomers to the online slot industry, they had plenty of experience designing games like these for land based casinos. 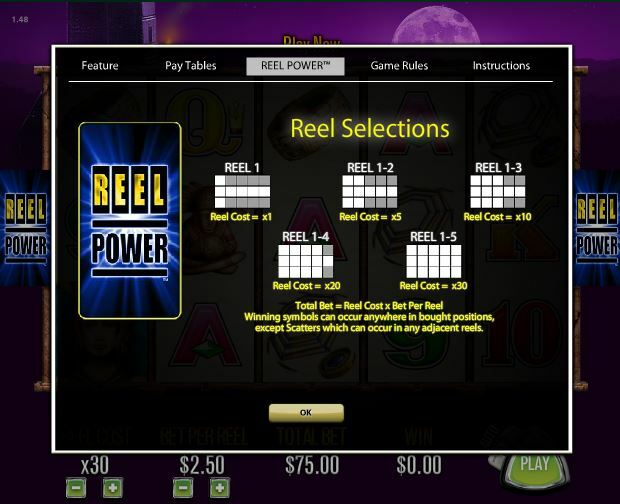 You’re getting 243 ways to win from the Reel Power feature, which uses up to 5 active reels. There are also free spins, twin reels, scatter symbols and wilds. Top prizes will go up to $2,500. 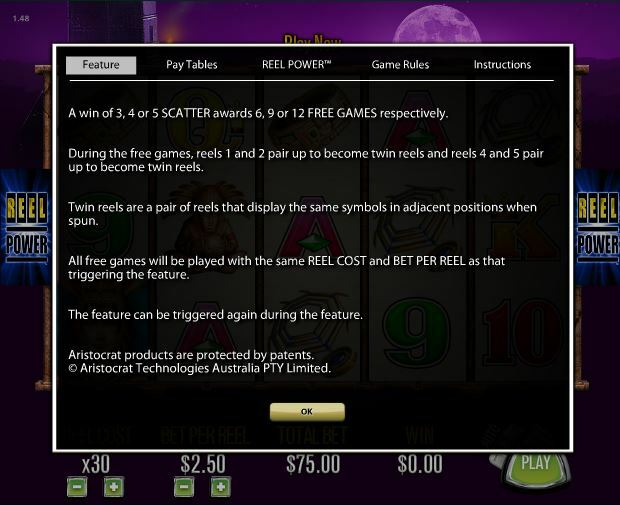 Among the features you will discover in Firelight there will be an interesting wild with random multipliers, scatter symbols and free spins which have twin reels as their main differentiator. Reel Power is one of the things that sets this game apart from many others. It’s actually the system which other slots call ways to win, where symbols form combinations if they’re on consecutive reels, from left to right. You get 243 ways to win here, though the slot doesn’t mention this number. You can activate 1 to 5 reels fully, while the ones that aren’t fully used have only the middle row active. The cost is between 1 and 30 coins. One unusual thing about this game is that depending on how many reels you activate, the paytable offers a different set of prizes, so you have both fewer chances to win and you get smaller prizes. It’s a good idea to keep all the reels active and use the maximum of 30 coins. Paytable 5 is the one you should be looking at if you wager the full amount. The wild symbol is quite important in the case of this game, even though it doesn’t give away prizes directly. It also only appears on the 3rd reel, yet it can be incredibly important when it does manage to substitute for another symbol, as it will use a random multiplier of 5x, 3x or 2x. 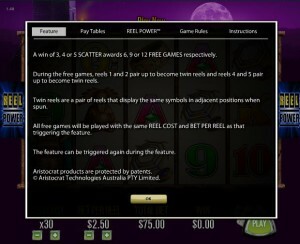 Scatters aren’t that different from regular symbols in a slot where ways to win are used, especially when they are forced to appear from left to right on adjacent reels. Represented by the Phoenix bird, the scatter pays up to 30x the bet for up to five symbols. Having multiple scatters present doesn’t just give you cash prizes, it also triggers the slot’s free spins. You receive 12 free spins if you have the maximum of five Phoenix scatters, 9 if you have four and 6 if you have the minimum of three symbols. 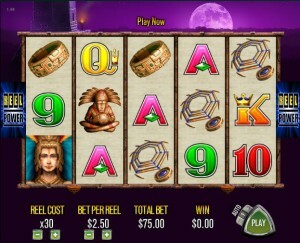 The free spins benefit from a feature called Twin Reels. The 1st and 2nd reels pair up, while the 4th and the 5th ones do the same. The symbols which appear on twin reels are identical, so you have a head start when it comes to forming new combinations. Since ways to win are used on the 5 reels, you will have to bet on paylines, as it wouldn’t be practical to cover 243 individual ways to win. There are 30 lines used for this purpose, with individual line bets going from $0.01 to $2.50. Up to $75 can be used in a bet each round. If you activated all five reels, you will get paid according to Paytable 5, which mentions up to 1,000x in prizes when you have five scatters. That’s a top payout of only $2,500, but you can expect lots of small rewards like this instead of a few big ones. It’s one of my favorite slots from Aristocrat’s collection, a game which uses ancient civilizations as a theme and does it very well. A huge purple moon is visible behind the reels, with an ancient temple in a corner, but for the most part it’s a pretty dark background. The reels are surrounded with stone made borders and they offer you symbols with tribal objects, idols, drums and jewelry. The poker cards are also there, and they’re the ones used in all Aristocrat slots, without any attempt to create a themed design for them. Symbols: Phoenix Bird (1,000x, scatter), Volcano (wild), Warrior (500x), Idol (250x), Drum (250x), Ring (200x), Necklace (200x), Ace (100x), King (100x), Queen (100x), Jack (100x), 10 (100x) and 9 (100x). The theme is interesting enough, and the design isn’t bad either, so overall I’d say give it a try. It has other advantages as well, like the ways to win, the free spins with twin reels or the multipliers applied by the wild symbols. 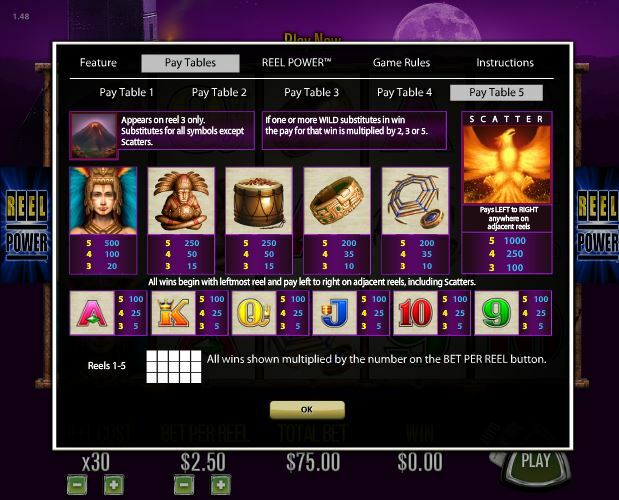 This Firelight slot is offered by all online casinos with Aristocrat software, playable either in practice or in real money mode.